Home Possible Mortgage Advantage is a Freddie Mac loan product that only requires borrowers to put 3% down on the Advantage program. One does not need to be a first time home buyer. However, if you are a first time home buyer then you will be required to obtain first time home buyer counseling certificate prior to closing on your loan. You can check with your loan officer for the nearest home buyer counseling center. However, the their definition of a first time home buyer is not what one would think. They define first time home buyer has not having an interest or ownership in a property in the last 7 years. There are income limits to this program. They are determined by the Loan Prospector which is the Freddie Mac approval system for subject property area. There are no income limits if the subject property is located in an underserved census tract area as determined by Loan Prospector. Mortgage insurance is required for this loan product. There are two different types of mortgage insurance. One can either obtain borrower paid mortgage insurance or Pay Advantage mortgage insurance. To qualify borrowers can not own any other properties such as second homes or investment properties. You are only allowed a 1 x 30 day late payment on your credit report if your fico score is over 720. If your fico score is less than 720 then lates are not allowed. Your debt to income ratio is approved by Loan Prospector. That means there is no set limit. Generally, if you list more assets and have a higher fico score you have a better chance of being allowed to also have a higher debt to income ratio compared to someone else with let’s say a 640 middle fico score and no assets in the bank. 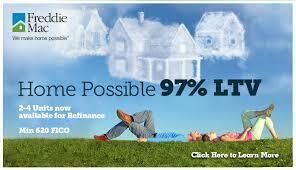 This loan product is only available on owner occupied single family residence, townhomes, condos, or a 2-4 unit. It is not allowed on a manufactured or stick home. Since home mortgage loan guidelines change frequently, please contact our office directly for more information.